Sunday morning, everyone on or near the Eastern Seaboard has a rare chance to watch an eerie celestial spectacle at sunrise. The sun will come up over the east horizon while in a partial solar eclipse. Instead of a golden ball, the sun will be a weird, upside-down thick crescent with, as seen from New England, a big bite missing from its lower right. That is, it will if the weather permits. Sunrise for Boston happens Sunday at 6:20 a.m. Eastern Standard Time. (Daylight saving time ends just a few hours earlier, at 2 a.m.) Locate a spot with a good view of the east-southeast horizon, and set your alarm to be there in plenty of time. Sometimes the atmosphere dims and reddens a low sun enough that you can briefly view it directly. If it’s too bright, you’ll need to bring a safe solar filter to protect your eyes from possible permanent injury, including by invisible infrared light. This is especially important if you’re using binoculars or a telescope. And the sun brightens rapidly as it climbs above the thick layer of air at the horizon. The bite out of the sun is the silhouette of the new moon just as the moon begins its new monthly circuit around the sky. Minute by minute the bite from the sun will shrink as the moon creeps along its orbit, even as the sun rises higher as day advances. For New England, the last edge of the moon will leave the sun’s face at 7:12 a.m., but it will be solar-filter time long before then. If you want to try for pictures, use a telephoto lens (100- to 500-mm focal length) to enlarge the sun to a reasonably good size while including some nice foreground. Don’t burn your camera’s sensor by waiting until the sun is too high and bright. If it’s cloudy Sunday morning or if you don’t happen to have a safe solar filter lying on the closet shelf, you can search online for views from elsewhere across the world as the day advances. The eclipse will be total, a more spectacular event, along a narrow line crossing the Atlantic Ocean and equatorial Africa from Gabon through Kenya, where eclipse tourists are gathering. The eclipse will be partial across a much larger area of the world, including the Caribbean, northern South America, southernmost Europe, the Middle East, and Africa. But in most areas, the sun will not be so dramatically close to the horizon as it will be for us. Consider this eclipse a warm-up. The big one that US eclipse chasers are waiting for will happen on Aug. 21, 2017. On that day, a total solar eclipse will sweep across the United States from Oregon to South Carolina, with partial phases visible all across the continent. 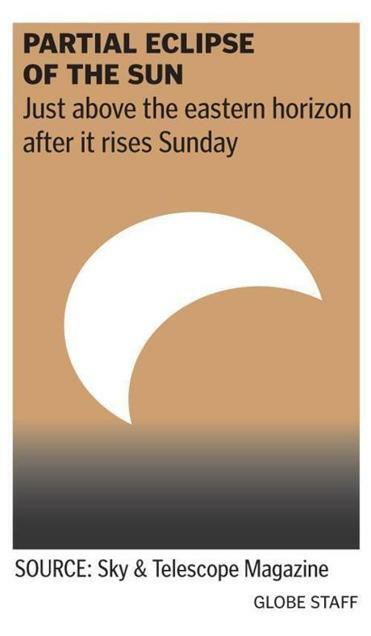 Over New England that day, the sun will turn into a thinner crescent than it will Sunday morning. By Monday evening, the moon will be a day and a half farther along its orbit, far enough that you can spot it as a thin, hairline crescent very low in the southwest in early twilight. Look around 4:45 or 5 p.m.
Now that it’s November, the first bright stars of winter are already coming into view. Go out after about 7 p.m., and bright Capella will be sparkling in the northeast. Capella is one of the brightest stars in the sky, noteworthy for being the same temperature and pale yellow-white color as our sun. Far to the right of Capella, look for the little Pleiades star cluster. It’s the size of your thumb tip at arm’s length. Look more than a fist-width below the Pleiades for Aldebaran, which is only orange-hot. These rise higher as the evening grows late. By 10 p.m., the bright planet Jupiter is up and glaring far below Capella, in the constellation Gemini. Look for Castor and Pollux to Jupiter’s left. Much farther to Jupiter’s right, Orion is now climbing up the sky, a celestial signature of winter’s approach. Easy-to-use maps of stars and constellations across the entire evening sky are available at SkyandTelescope.com/gettingstarted. Alan M. MacRobert is a senior editor of Sky & Telescope magazine in Cambridge (SkyandTelescope.com). His Star Watch column appears the first Saturday of every month.